This was a four day cruise from New York City calling at Bermuda. Carnival Horizon is the second ship in Carnival Cruise Line's Vista class. In many respects, she is the same as her older sister, Carnival Vista. However, there have been some additional features added and the color scheme is somewhat lighter than Vista. The Vista class ships reflect a more mature Carnival. Gone are the bold, imaginative and often outrageous interiors. Instead, the interiors are more like a contemporary hotel, pleasant and restful. These ships also offer guests more options both in dining and in activities. Inasmuch as they are larger than their predecessors, this is not surprising. 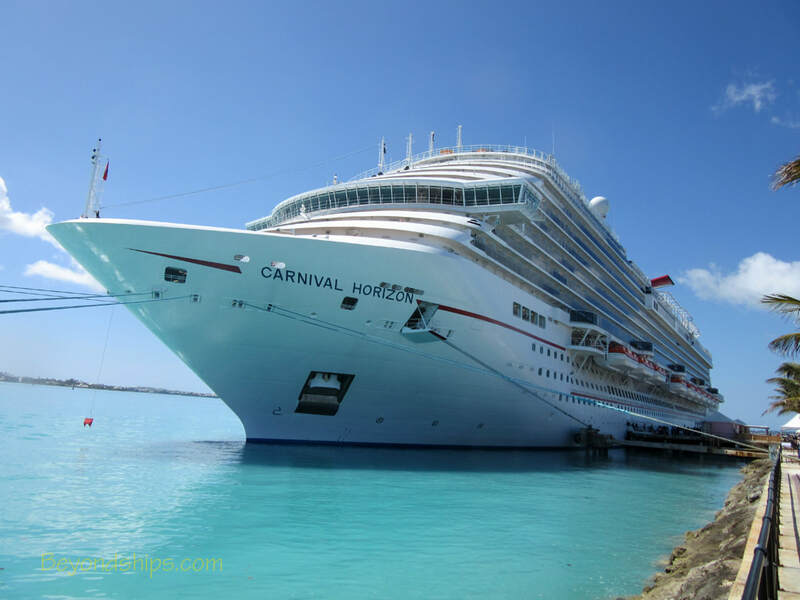 However, it also reflects Carnival's strategy of competing with the other mass market lines not just on price but on the features aboard its ships. The evolution towards a more mature Carnival began with the Dream class ships. Carnival Sunshine - - the totally transformed Carnival Destiny - - was the first ship to embody this new concept. Based on its success, Carnival built the Vista, which was the new Carnival from the first piece of steel laid down in the shipyard. Cruisers who are familiar with Vista and/or Sunshine will know Horizon. This was Carnival Horizon's inaugural American cruise. The ship had done a few cruises in Europe after entering service in April followed by a long transatlantic crossing. Nonetheless, it still had the fresh scent of a new ship. everything was clean and new. Horizon's crew, many of whom had taken the ship from the shipyard into commercial service, were clearly proud of their ship. The crew were happy to be there and they wanted the guests to be happy as well. This manifested itself in friendly and excellent service. Moreover, this attitude was not just a few eager-beavers but seemed to be shared by all. Carnival Horizon offers a host of entertainment options including production shows, Imax movies, big screen outdoor movies, stand-up comedy and various forms of live music. The entertainment staff also high-energy theme parties as well as the traditional shipboard activities such as karaoke, trivia contests and bingo. The most startling addition to the entertainment line-up on Horizon was a new production show called Celestial Strings. In this show, contemporary hits are re-imagined in a surrealistic setting. Performing are the ship's singers and dancers as well as electrified classical string musicians. The theater's LED screens provide not only a background but interact with the players becoming performers in their own right. Such a show would not be unexpected on a Celebrity ship but it is much different than anything Carnival has done before. The audience had an overwhelmingly positive reaction to this sophisticated programming. On this cruise, there was essentially no enrichment programming. Essentially, the lectures were limited to talks by the spa and shop personnel, which relate to the offerings in the spa and the shops. On certain longer cruises designated as Carnival Journeys, Carnival has an excellent lecture program that covers a variety of topics in an accessible and entertaining way. It is disappointing that similar programming has not been extended to Carnival's shorter cruises. Many cruise ships have lectures by the staff of the art gallery, which is operated by a concessionaire. These lectures are usually designed to promote the gallery and its offerings but they can be entertaining. There are no such lectures on Horizon as there is no art gallery on Horizon. In its place Horizon has the Pixel Gallery, which offers artistic photography done by Carnival's photographers. Horizon also offers a wide variety of dining options. Indeed, one would be in grave danger of bursting if you tried to eat at all of them during a short cruise. Horizon has two main dining rooms. One dining room is open for breakfast and Seaday Brunch on an open seating basis. Both dining rooms are open for dinner and guests have the option of the traditional two-seating system or a flexible dining system. In addition to a number of items that change each night, there are several “classic” items that are always available. The food was good quality and the service was friendly and efficient. A Carnival tradition, the waiters sing and dance as part of the entertainment. Veteran maitre d' Ken Brynes sang his impressions of Frank Sinatra classics. Of the various complimentary lunch venues, three stand out. First, the Guy's Burger Joint offers very tasty burgers with a variety of toppings created by celebrity chef Guy Fieri. While this restaurant offered a burger that was far ahead of other seagoing burgers when Carnival introduced the concept several years ago on Carnival Breeze, some of the other lines (e.g., Holland America's Dive-In burgers) have narrowed the lead. Still, this is a really good burger. Opposite Guy's Burger Joint on the port side is the BlueIguana Cantina, which has very good made to order tacos and burritos. Third, during the day Cucina del Capitano becomes a pasta bar. You can order a variety of different pastas with different sauces and ingredients. In addition or as an alternative, you can have a tasty beef lasagna. At one time, the Carnival ships only had one extra-tariff specialty restaurant. Now, on Horizon, there are several including Italian and various Asian-inspired venues. The one for a special night out remains, however, the steakhouse. (See separate article). Horizon has two more dining venues than Carnival Vista. First, a Teppanyaki restaurant has been added next to the Bonsai Sushi specialty restaurant. This type of Japanese-inspired specialty restaurant has long been popular on Norwegian Cruise Line and this is Carnival's first such venue. Guests sit around a rectangular table. A chef prepares the meal using a cooking surface in the middle of the table with flashing knives and more than a little showmanship. Second, Horizon has Guy's Pig and Anchor Smokehouse and Brewhouse. This venue specializes in barbeque dishes created by Mr. Fieri. While Carnival Vista has an outdoor barbeque venue, Horizon has both an outdoor venue and an interior restaurant. The latter is located where the Red Frog Pub and Brewery is located on Vista. Don't worry, the onboard brewery is still there, it has just been incoprated into this new restaurant. Carnival Horizon can carry nearly 5,000 guests at maximum capacity. On this cruise, all of the cabins were occupied but not all of the beds were full (some cabins have third or fourth beds) and so the number of guests was closer to 4,700. While this is a large number of people, the ship did not feel crowded. When a ship offers guests a range of dining venues and activities, the passengers become spread out. Of course, places like the pool areas are going to be crowded on a nice day, but there was no difficulty finding a chair or place to stretch out on the outdoor Lanai (promenade). Horizon is not designed to be an ocean greyhound. Her standard service speed is 18 knots, although she can get up to 23 knots. This itinerary did not require Horizon to go above her service speed. The weather throughout this cruise was little short of magnificent. As a result, Horizon's nautical qualities were never put to the test. The ship sailed smoothly with little motion both to Bermuda and back to New York.